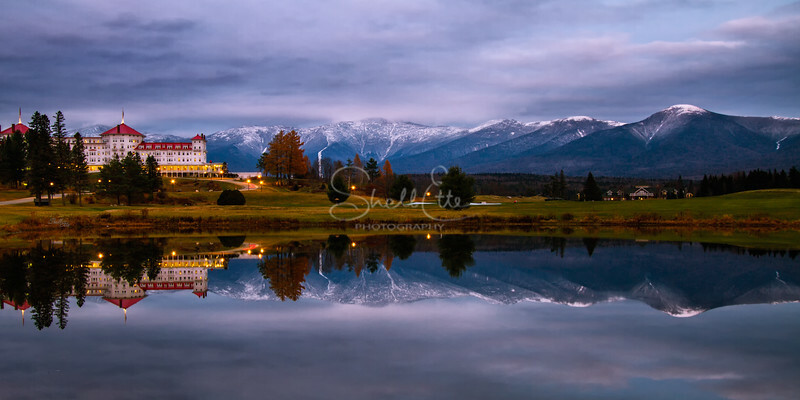 Panoramic images of mountains and valleys, lakes and seashore. 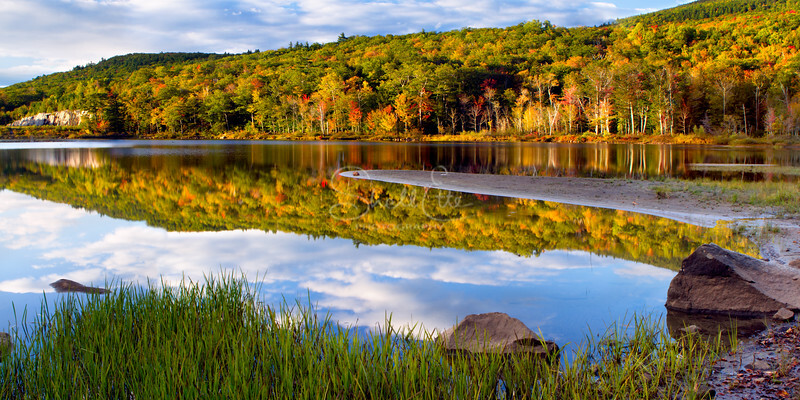 A cove on Jericho Lake in Jericho Mountain State Park during autumn with clear blue skies. Size: 45x12. This can be split into different sizes. It was clear blue sky most of this day. A few clouds formed late in the afternoon so I followed them to Newfound Lake wondering if they would offer a nice sunset. Wellington State Park seemed to be the best location to set up and wait. The sun set and little color appeared, then it faded. I waited and it got darker. I packed up and was heading out, when I turned for one last time and I saw some more color. I stood and waited. I was sure glad I looked back. It grew into this. North and South Twin Mountain covered in a fresh coating of snow, surrounded by Tamarack and Birch trees still in their beautiful autumn yellow colors. View of Eagles Lake and Franconia Ridge from the Greenleaf Hut. A wave crashes as hurricane Sandy approaches Rye, NH, along the Atlantic Coast. The tide was coming in but still low here. The hurricane was in full force a few hours later at high tide. 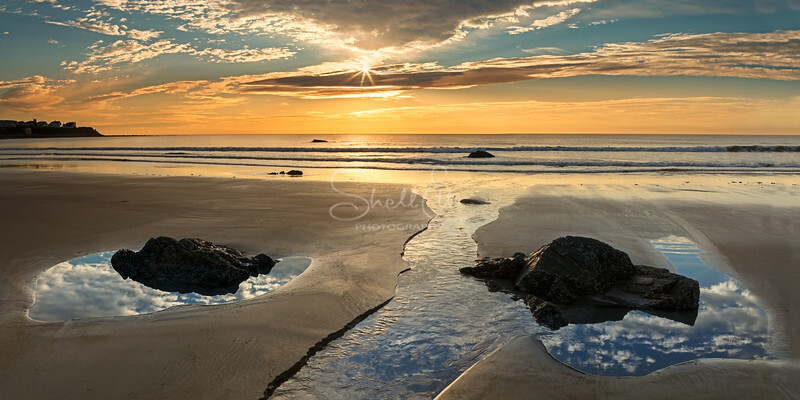 I would have loved to capture that scene, but noone could be near the shoreline then. Snow came early this season. Trees are still blooming with colored foliage, surrounding the Twin Mtns. The autumn colors were vivid in Franconia Notch. I was on top of Artist's Bluff waiting for the sun to rise. The fog rose up and formed a cloud and blocked the sun just as it was going to peak over Mt Lincoln, creating a stormy and moody scene. 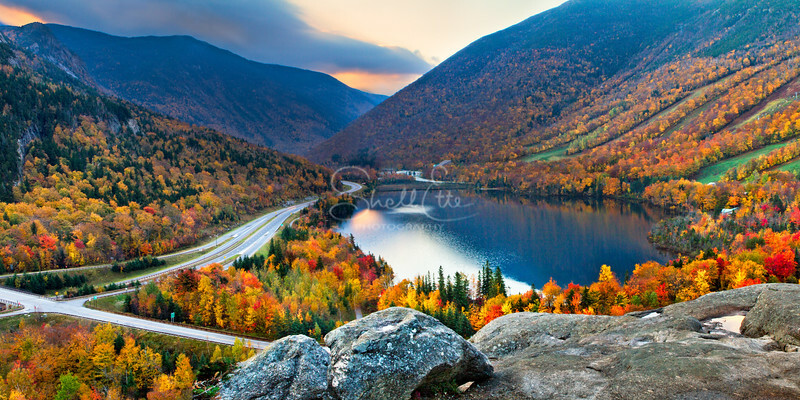 This is view of Cannon Mtn and Echo Lake valley as the setting sun paints and highlights the rich autumn colors of the trees. This is taken from a ledge in Franconia that is a popular hiking trail. A beautiful spot to watch the sun rise and the sun set. This is looking south. A beautiful day atop Mt Washington is when you can see for miles. 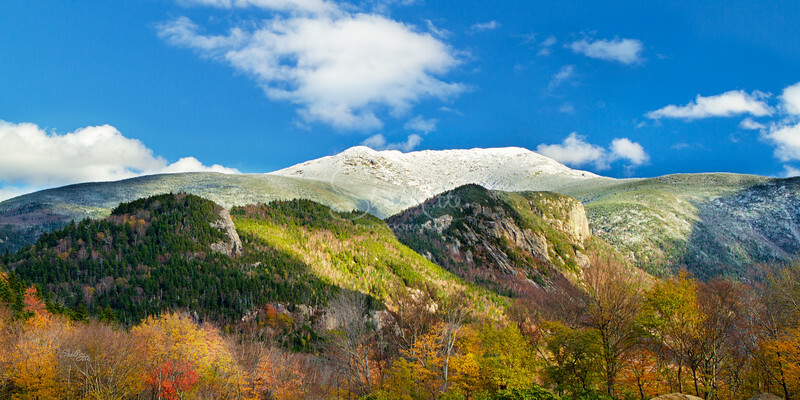 When the conditions are right, the White Mountains will look blue even with autumn foliage coloring the trees below. This is the view looking south southwest. There are two paths you see at the bottom center. The right is the Appalachian Trail taking you to the Lakes of the Clouds. The Lakes of the Clouds Hut is to the right of the frozen snow covered lakes perched on the ledge overlooking the Ammonoosuc Ravine Trail. At the Hut, this trail splits in three. 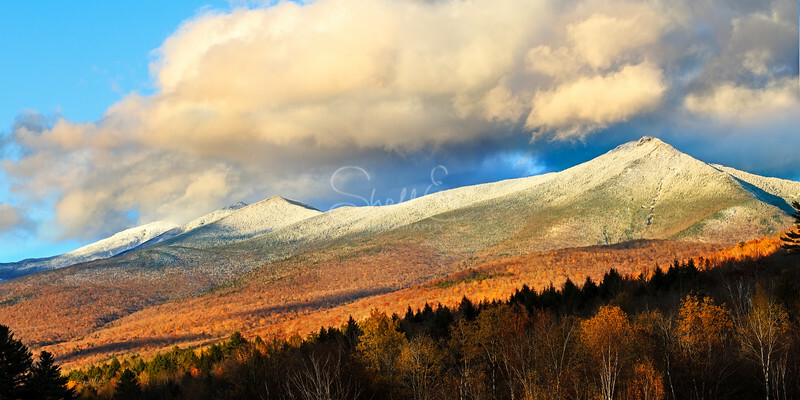 The right will take you up and over Mt Monroe, the closest pointed peak. The center trail continues on the Appalachian Trail and takes you around Mt Monroe, re-connecting again on the other side. Here the trail continues along the steep ridge to Mt Franklin, then down and back up to Mt Eisenhower. Mt Pierce is next, then Mt Jackson and then Mt Webster where you will be looking down upon Rte 302 in Crawford Notch. The left leg of the split will take you down into the valley, this is the Dry River Trail, as it travels along the Dry River all the way to Rte 302. You can see a section of Rte 302 in Hart’s Location. Looking deeper and meandering through the valleys to the far left corner you can see Squam Lake. The left path is the Davis Path, this crosses the Tuckerman Ravine Crossover path and brings you to the peak of Boot Spur and then over to Mt Isolation, which is the peak you see on the front left. Behind that is Mt Davis, then Stairs Mtn and beyond that is Mt Resolution before dipping down to Bartlett, NH. You can also see the Cairns on this path which help mark the trail for hikers when the thick fog and clouds surround the mountains. The mountains are blue due to an Atmospheric phenomenon, known as Rayleigh Scattering. It requires certain weather conditions, but it is when the air is full of particles, and the filtered sunlight is scattered while passing through these particles painting everything in the distance with a blue haze. Oliverian Pond filled with autumn splendor.